A Metropolitan (Met) Police officer who was jailed for carrying out a property scam while investigating the 7 July bombings has been formally sacked. 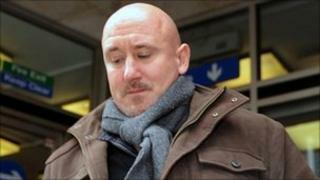 Det Con Daren Pooley, 41, overcharged the Met for rented apartments while deployed in Leeds in 2006. Pooley, a counter-terrorism officer who had served in the Met for 12 years, was convicted of conspiracy to defraud and jailed for three years in October. He has now been dismissed without notice by a Met gross misconduct board. Pooley, a father-of-three from Spalding, Lincolnshire, was on long-term deployment when the fraud took place. His wife Nicola, 38, of Sleaford, Lincolnshire, was found guilty of the same charge and jailed for 36 weeks, suspended for 18 months. Mrs Pooley's brother-in-law Stephen Butler, 59, also from Spalding, was jailed for 12 months after pleading guilty to conspiracy to defraud. Their arrest followed an investigation by the Met's Directorate of Professional Standards (DPS). Commander Mark Simmons said: "The Met was facing difficult times and all Pooley saw was an opportunity to try to make a quick profit. "His corrupt behaviour has justifiably had serious consequences for him, with his significant prison sentence and as a result losing his job. "The Met does not need officers like him and the DPS is committed to rooting out all corruption." Between April 2006 and September 2007, Pooley, his then future wife and Butler charged the Met £1,950 for apartments for which the officer was paying £650 in rent.